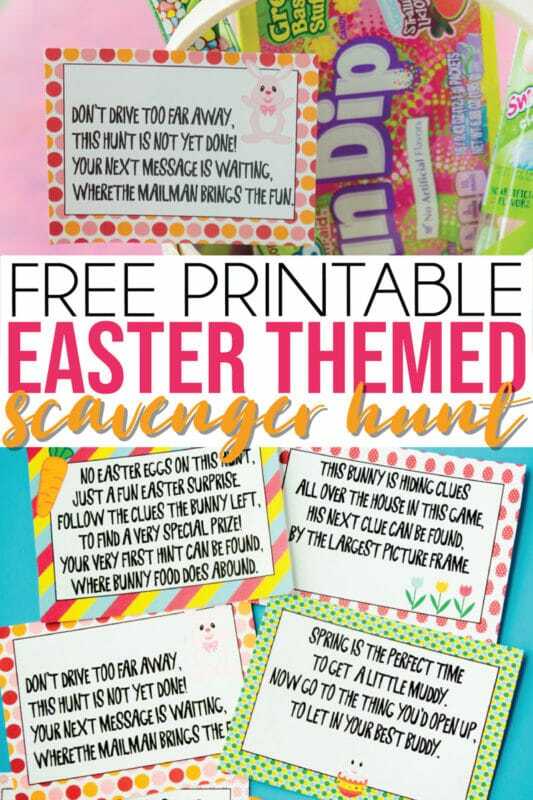 This free printable Easter scavenger hunt comes with 12 unique Easter scavenger hunt clues and is so fun for kids! 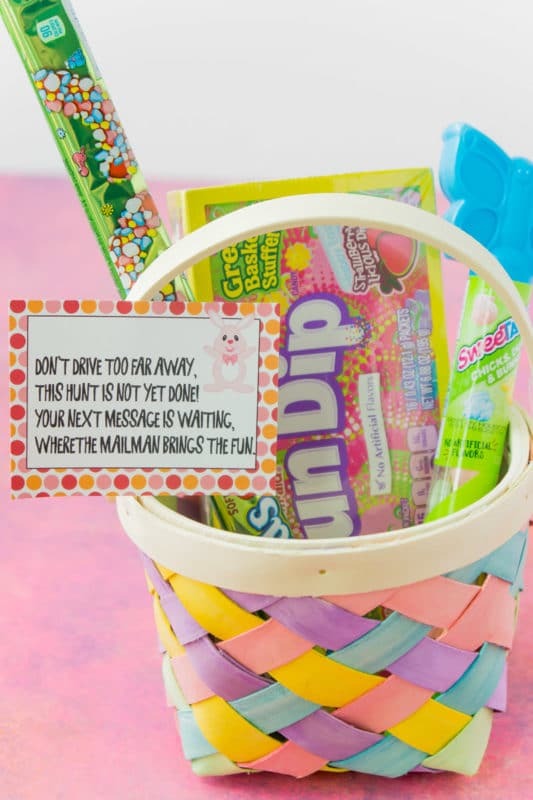 It’s the perfect way to lead kids to Easter baskets, Easter eggs, or any other Easter surprise! 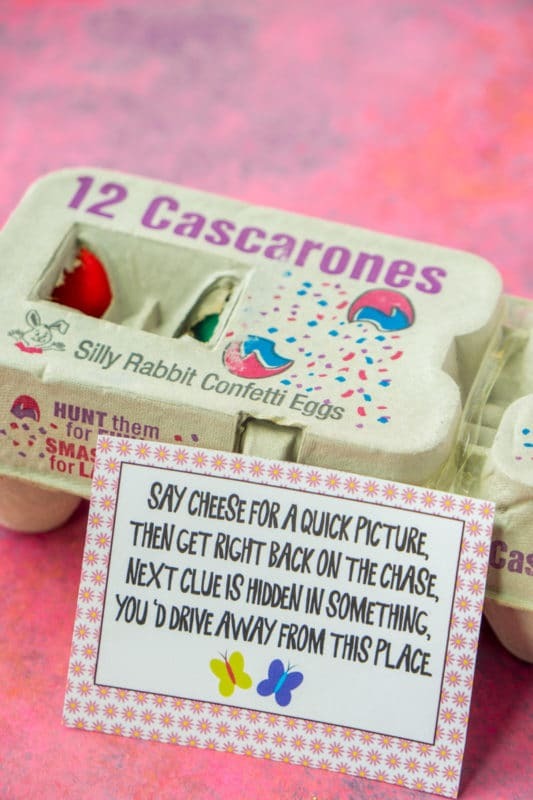 Simply print out the Easter scavenger hunt riddles and hide them around the house, then let the hunt begin! Can we talk about how my son now expects scavenger hunts for every holiday or occasion. And every weekend in between. I’m afraid I’ve created a monster. We literally got home from a 10 day spring break trip (to Disney World!) and because we were coming home on St. Patrick’s Day, he immediately asked for a St. Patrick’s Day scavenger hunt. 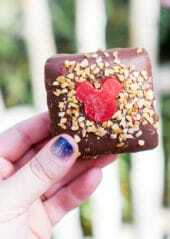 Luckily I already had one made and had picked up some surprises for him on our last trip, so it wasn’t a big deal. But still, a little scavenger hunt monster I tell you. 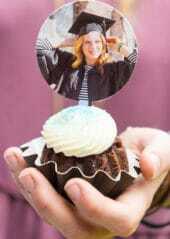 I’m going to get through all of these scavenger hunt ideas before summer is over for sure! He hasn’t asked for an Easter scavenger hunt, but I already know it’s coming so I went and created this one ahead of time. I’m planning to use it Easter morning to lead him to his Easter basket hidden somewhere in the house! Right before we try out one of these Easter egg hunts! You could totally use it for anything else too – maybe hide eggs at each of the locations or little surprises along the way like I did. If you’re new to scavenger hunts, they’re pretty much like treasure hunts with clues leading to a treasure at the end. Kind of like X marks the spot with a pirate treasure hunt, which reminds me I need to make a pirate treasure hunt one of these days! Maybe next time we go on a Disney cruise I’ll do it for pirate night! This Easter scavenger hunt is made up of 12 different clues including the starting clue and then clues leading to 12 different locations. There isn’t a note at the final location, just whatever surprise you’ve hidden there! If you need Easter surprise ideas, here are some of my favorites! 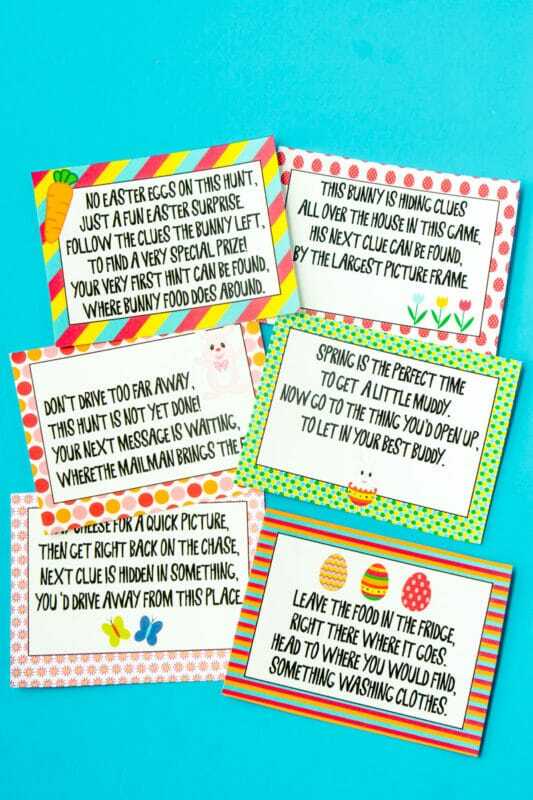 Whether you call these clues or Easter scavenger hunt riddles, they’re pretty much the same thing. Twelve cards with clues that rhyme and lead to different locations around the house. I’m typically creating clues for younger kids like my almost six-year-old so the clues pretty much give away the location. We’ve tried a few times where he has to figure out some sort of riddling clue, and it’s never as fun because he tends to get stuck and need help. As he gets older, I may start creating more complicated clues but for now – simpler clues have worked great for all of the holidays over the years! As I mentioned before, there are 12 clue cards – each leading to a different location. 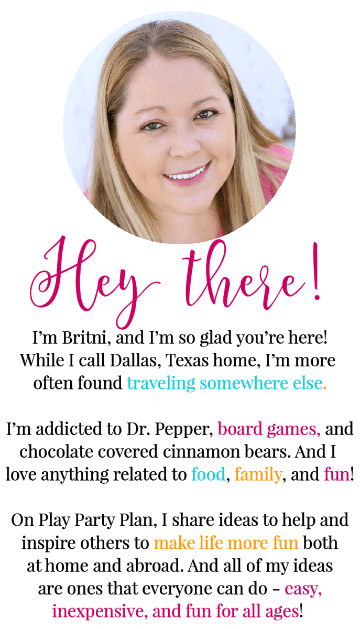 In all of my printable scavenger hunts (and I have a lot of them), I use locations that most everyone should have in a regular home. If you’re staying in a hotel room or want to do this outside, unfortunately you’re out of luck. This hunt is designed to be played indoor/outdoor at a regular home with a kitchen, bedrooms, bathrooms, etc. That being said – there aren’t any specific locations on the cards (i.e., I don’t say go to K’s bedroom or to the upstairs guest room). They are all generic enough that anyone could really use them! Check out the picture below for a couple of example clues! The rest of the clues can be found in the download at the end of this post. Simply print out the scavenger hunt cards and cut them out, keeping them in order. The order doesn’t really matter but the clues do tell a story and tie together so if you mix them up, they’ll still get to all of the locations but the clues won’t make as much sense. 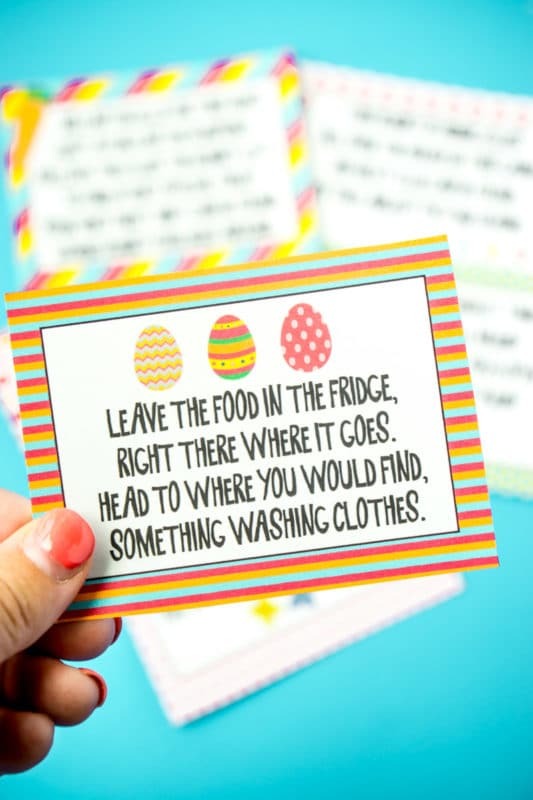 Keep out the first card – this will be the card you hand the kids to get the Easter scavenger hunt started. Place the second card in the location mentioned on the first clue card. Place the third card in the location mentioned on the second clue card. And so on until you get to the final card – then place your surprise (Easter basket, etc.) in the location mentioned on the very final card. 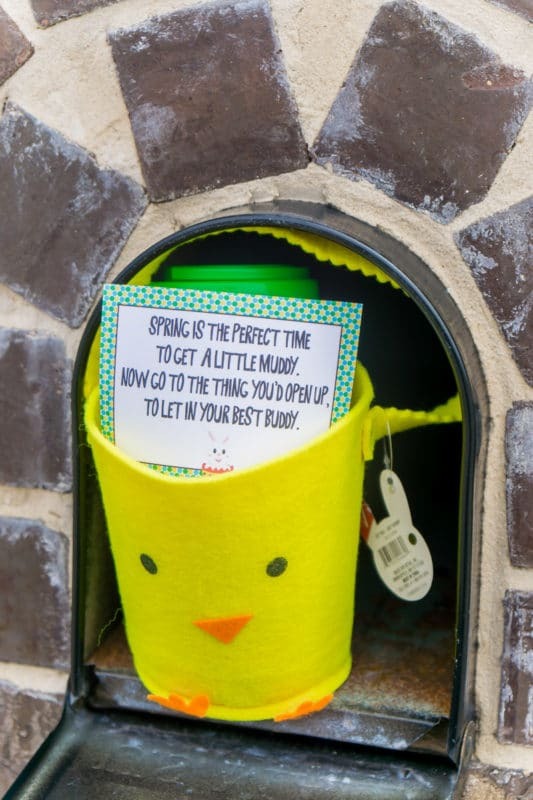 To make it even more fun, you could add little Easter eggs filled with treats, other Easter surprises, or really anything along the way at different stops like I did. You could even give them an empty Easter basket and have them fill the basket with their surprises along the way. The only real key is to have a surprise at the end. Scavenger hunts aren’t any fun without treasure to find! And I’ve put together a list of my favorite Easter surprises and gifts for kids below. 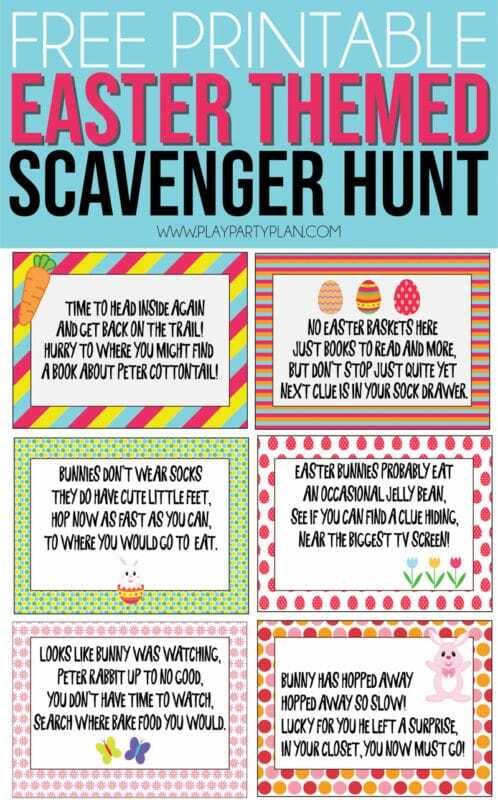 Once you’re done with the scavenger hunt, keep your kids active with these fun Easter games! Some of these are things you can buy, some are things you can DIY, and others are things you probably already have around the house. 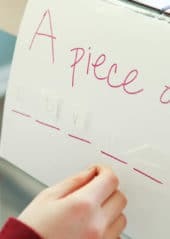 If this list isn’t a good fit, any of the ideas on this Easter basket filler list would make fun prizes for this Easter scavenger hunt too! Enter your first name and email below to get a printable PDF copy of the Easter scavenger hunt. Once you fill out the form, you’ll be taken directly to the PDF and receive a copy to your email inbox. If you cannot find the form, click here to get to it. The PDF will come with a two-page document with 12 different Easter scavenger hunt clues. Need more fun things to do for Easter? Any of these activities would be perfect with this scavenger hunt! 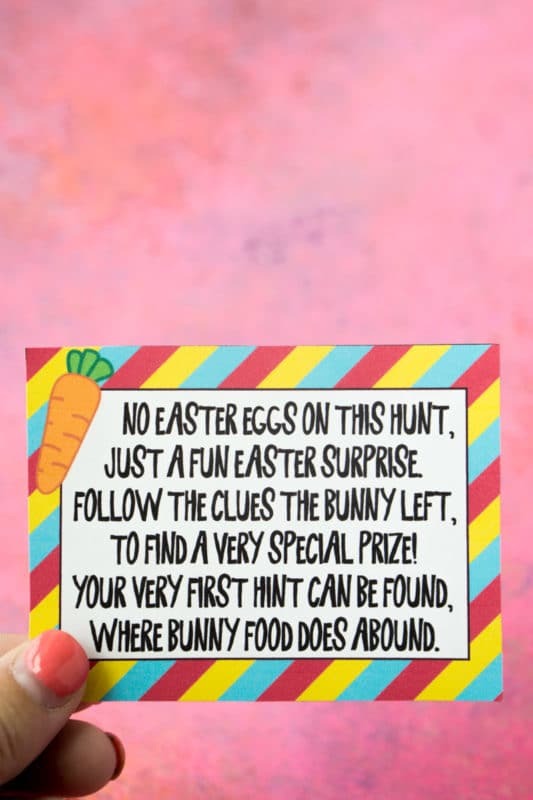 Don’t forget to pin these Easter scavenger hunt clues for later! Ok, I’m definitely doing this to my kids. “Search where bake food you would?” Sorry, but I don’t want to teach my kid bad grammar habits. I was channeling Yoda, totally get it if it’s not your cup of tea! Your kids definitely won’t be affected by an occasional unusual example of syntax. I’m a linguist as well as a teacher, so this is not just my opinion but actually fact. Besides, lots of poetry uses unusual syntax (think Shakespeare, for starters). Stupid parents, because that’s what’s going to make or break them when your kids applying at Walmart. Thank you to the writer for her fun on words. Putting this together for the teens to go between family houses with your clues. I’d like to think I’m creative, but a riddle writer I am not!